Here is exciting news and offer has launched by Mobilink network for its valued customers. Mobilink has brought one more time exceptional service and deal for its new prepaid SIM buyers of Pakistan. This time it is providing free incentives for calling, texting and internet buffering after buying new SIM connection of Jazz. This is mind-blowing facility has introduced from this network side for its valued consumers throughout of Pakistan. Ufone is giving same kind of facility with the name Ufone New SIM Offer 2016 along with free balance and now it is time of Mobilink telecommunication for launching Mobilink Jazz New SIM Offer for its valued new customers of Pakistan. It is providing calling, messaging and internet free incentives for using all these three facilities in free of cost. This is possible after buying new connection of Mobilink for availing non-stop calling, texting and internet service with seven days validity. It is also giving various astonishing options for using after re-charging balance of new SIM. The complete details and information of this offer are mentioned as below. Step 2: Customers just need to verify his/her new SIM connection through bio-metrically system from giving original national identity card (NIC). Customers just to dial *999# and avail this facility after buying new SIM of Jazz. Customers receive 700 calling minutes for calling on same network numbers. 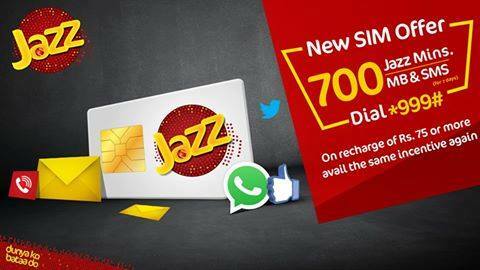 Customers get 700 SMS bundles for sending SMS on any local networks of Pakistan. Customers also receive 700 MBs 3G internet volume for using with speedy service. The validity for using these free incentives is available for seven days. Customers also get option for getting same incentive of more 700 calling, 700 MBs internet and 700 SMS bundles after re-charging balance of RS 75.00 or more then this amount. This other option facility will available for subscribers till 30 days from date of buying SIM. Subscribers can get information of this offer by dialing *992*2# and then press call button. Subscribers can get status about incentives by dialing *9932# and then press call button. Subscribers can De-activate this feature by dialing *999*4#and then press call button. There are no charges for De-activation this service. This offer is only available for those cellular operators who will buy new prepaid SIM connection of Mobilink after date of 20th July 2016. Call setup charges will be applied of RS 0.12 plus tax. This is offer can be used till 31st August 2016. Users can also avail other Mobilink call packages with this offer. All taxes will be applied for using this feature.